I have been working closely with Hillary and Francesca since the beginning of Summer 2017, doing things like renovating and fixing up the barn, going on field trips to art museums, and researching indoor agriculture technology. We even went to the 3-day Farm Science Review in London, Ohio to attend workshops about farming. I have been sacrificing my time and effort because I believe what they are doing is very important, worthwhile, and innovative. They are bringing new ideas and fresh perspectives on art and agriculture to our town, and exposing the youth of our community to things they might have never learned about otherwise. I hope that their work continues to provide inspiration and that it might stoke the flame of creativity in all of us. I know it has for me and many of the students they have taught and influenced. I am happy to be a part of this work and excited about our future plans. When I first met the artists of SOIL SERIES: A Social Drawing, Francesca and Hillary, I was Director of Teen Development for Empower Youth. They came to me with a plan to help the youth in our community and asked if I would help. Of course I wanted to help, and now I research for them. I have especially enjoyed recently reading about aquaponics. As a research assistant, I mostly help out by looking for grants and funding opportunities to support our future plans of programming in art and agriculture. I advocate for our work in the community and I even helped put together the silent auction for their recent exhibition. I was also one of the many that helped turn the barn into a functional, cool, art studio. I couldn’t be more proud of everyone that helped make it what it is. Directing, guiding, and mentoring children and teens are my favorite things to do. It’s a beautiful thing to watch children and teens become completely different people because of just one person that showed them they were loved and cared about. That’s why I help Empower Youth and Francesca and Hillary. After kids realize we are on their side, they become empowered. And guess what? Empowered people empower people! If I empower one child, they can go on to empower others and show others they are loved. It becomes a chain reaction and it matters. I hope and pray the end result of this work is a restored community. I truly believe this ranch is a place where people come and feel like they are doing something meaningful, and that’s because they are and it’s a safe place for them. If you read this little bio about me and take away only one thing, I hope it’s this: Empower someone! Because empowered people empower people. As part of our research efforts we attended a grant writing seminar at the Public Library of Cincinnati and Hamilton County, and although Kayla was unable to attend, Alec agreed to join us in order to learn more about pursuing grant funding. 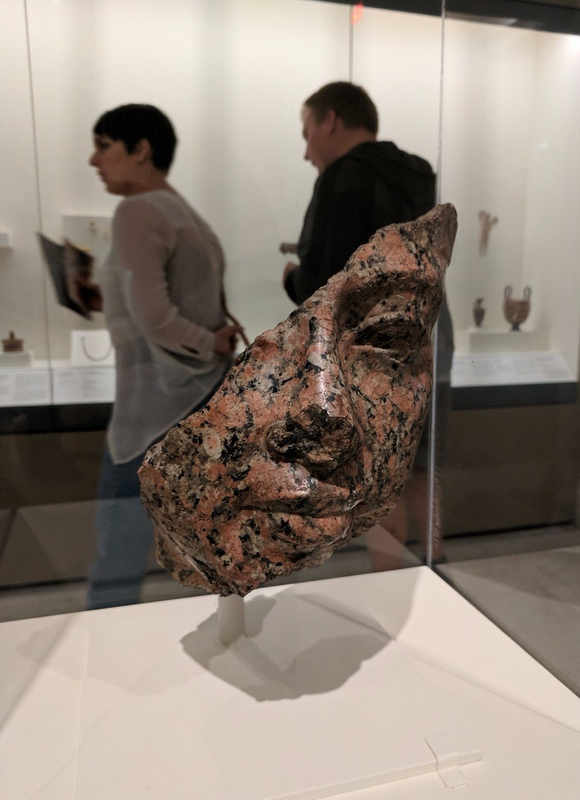 After the seminar, we paid a visit to the Cincinnati Art Museum and spent the afternoon looking at their impressive collection spanning from ancient Egyptian to contemporary art. This was Alec’s first visit to the museum and we had a lot of fun discussing the work together. Just recently we had the immense pleasure of visiting England’s home and studio. Stay tuned for an upcoming post about that experience! Pakistani-American artist Anila Quayyum Agha creates immersive installations by manipulating light. In All the Flowers Are for Me (Red), light emanates from the center of a laser-cut steel cube, enveloping the gallery in intricate shadows that ripple and change as you walk through the space. Inspired by Islamic architectural forms and referencing her experience as a diaspora artist, the geometric and floral patterns cast upon the walls, floor, and ceiling create a sense of belonging through shared experience. This poem by Matthew Kosinski was inspired by a piece in the museum’s Egyptian collection (below). Click on the image above or download the PDF of the poem here: Fragmentary Head of a King.